Canada's net federal government financial debt from confederation to 2011. The above chart illustrates the history of Canada’s federal debt; obviously something went terribly wrong after 1974. 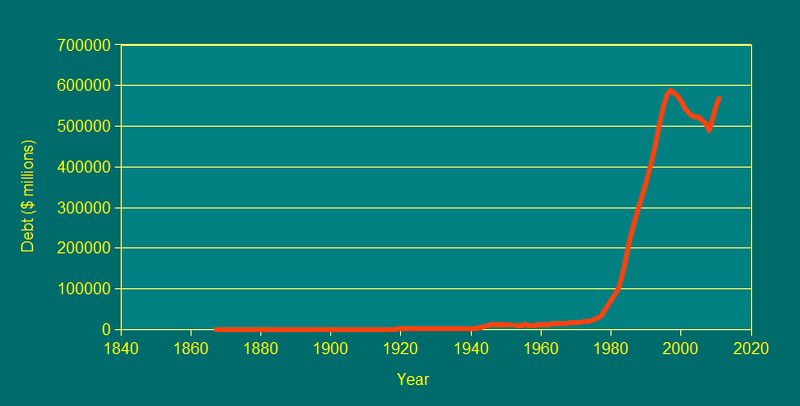 Over a 108 year period (1867-1974) the accumulated debt shows as nearly a flat line growing to only $21.6 billion. But around 1974, the debt began to grow exponentially and, over a mere 39 years, it reached over $600 billion in 2013. Paul Hellyer,2 also notes that lobbying by the banks and adoption of monetarism — the idea that “markets know best” and should be without regulation, and that public services should be privatized — took hold. So, around 1974, the Government of Canada began to borrow much of the monies to cover its shortfalls from the private sector at interest rather than creating money through the Bank of Canada interest-free. In other words, since 1974, the Bank of Canada has not been acting in the best interest of its shareholders: the people of Canada. The cost of borrowing is the third area that affects the annual deficit. In 1991-92, the interest on the debt was $41 billion. This cost of borrowing and its compounding effect have a significant impact on Canada’s annual deficits. From Confederation up to 1991-92, the federal government accumulated a net debt of $423 billion. Of this, $37 billion represents the accumulated shortfall in meeting the cost of government programs since Confederation. The remainder, $386 billion, represents the amount the government has borrowed to service the debt created by previous annual shortfalls. In other words, of the accumulated debt of $423 billion, the government really needed to borrow only $37 billion—accumulated over 127 years—to cover its shortfalls on real spending for goods and services. The rest of that accumulated debt was monies borrowed to service the debt, essentially a payment of interest on interest to the private sector when the government could have created the money to cover the shortfall at what amounts to be no interest. According to Paul Hellyer, from 1974–1975 to 2010, Canadian taxpayers have paid one trillion, 100 billion dollars ($1,100,000,000,000) in interest on the federal debt to private lenders.4 In 2011, alone, Canadian taxpayers paid the private lenders an estimated $37.7 billion to service the federal debt—over $103 million each and every day of the year!5 These are tax dollars that, ceteris paribus, could have gone towards infrastructure, health care, education, and other social needs (see examples in Table 1, below) if the Government of Canada used the Bank of Canada to create the money to cover its shortfall. Ultimately, the government could pay off the federal debt through the same means. Table 1. Examples of goods and services that $103 million could purchase. For example, $103 million--one day's interest on the federal debt--could pay the salaries of 1,550 nurses or 340 doctors. And consider this: from confederation to 1974, Canada fought two world wars, went through a major depression, constructed major infrastructures such as the St. Lawrence Seaway, Trans-Canada Highway, International airports, Canadian National Railway, and brought in social welfare programs such as Family Allowance, Old Age Security pensions, Canada Pension Plan, Universal Health Care and wound up with a total accumulated debt of only $21.6 billion. Today our federal debt is approaching $600 billion and the government is continually cutting services while our infrastructure is not being maintained. This “subsidy” to the private lenders must end. Those who are, for some inexplicable reason, opposed to having the government return to interest-free borrowing from the Bank of Canada, invariably bring out the red-herring argument that it will cause inflation. We have addressed this argument here. The solution to this problem is simply for the government to stop borrowing money from private lenders at interest and borrow from the Bank of Canada at no interest. The private banks should also be prevented from creating money. That right should be returned to the People of Canada through the Bank of Canada. To understand more about this issue, see the sites and articles below, watch the videos and see also Money Creation and Economic Growth on this web site. Public banking in America. A number of the associated videos also discuss the Canadian banking system. Looking at this info, the banks should return all the money back to the Canadian with interest. Let say 40% would be a reasonable rate. Can they be brought to justice? That should not have happen. Canadian have bin rip-off badly. My parents are suffering because of them. How many other are suffering? This may cause a revolution against our own country. Is group involve to bring these people to jail. Now many environmentalists want to restrict economic activity – and I agree with them. The creation of “easy” i.e. unregulated money has fuelled unsustainable consumption. Worse, credit has been directed at inflating the value of assets (e.g. property) that have enriched the rich, and impoverished those who do not on the whole own assets. Easy credit has been at the heart of the rise in inequality in western economies. But while we may want to limit consumption, and re-direct credit to more sustainable, useful activity, it would be a mistake to limit the things that society can do. We need, for example, to tackle climate change, a major threat to a liveable future. That will require huge resources to be directed at transforming and de-carbonising the economy. Carefully managed and regulated credit will help finance those activities. The money in our piggy banks would be woefully insufficient. This debate exposes a profound misunderstanding at the heart of economics, one heavily promoted by monetarists and the Austrian school: namely that it is possible to manage aggregate economic activity within an economy like Britain’s if an “independent committee” can just pre-determine money growth, and then shrink or expand activity. Restoring banking regulation to its proper place, and managing cross-border lending would once again restore balance to our financial system, just as it did in the period 1945-71. It would bring to an end the despotic power now exercised by bankers and the finance sector. By contrast, outlandish proposals for nationalizing money and granting huge powers to a committee of men to decide how much money we should all have, and whether to shrink or expand the money supply and economic activity will only add to the economic confusion that shrouds the banking system. Above all, it will ensure that things stay just as they are. Also you don’t seem to realize that there is already a committe of people deciding how much money we should have, they are called bank CEOs and they do not hold the Canadian common man’s interests as a priority. Their priority is to funnel the money to the top 1%. You must not have understood the article, or Modern Monetary Theory. It’s not that difficult. When we can print as much money as we want, we never have a national debt. Running a deficit is good, because it has been proven that the amount of federal deficit is the exact same amount as the money in private hands. If the government runs a surplus, that money comes out of the public’s pockets. The more the federal government spends on social programs and infrastructure, the more money it is injecting into the economy. By paying for construction and paving, as examples, it is putting money into the hands of middle class people who will actually spend it. Spend it on food and clothing and rent and mortgages and cars…. you get the idea. Whereas if the money simply goes to the rich, they hoard it, thus removing it from the economy, which causes recessions as we have seen this year after Harper’s austerity measures of running surplusses killed employment and caused a recession. As to another poster going on about ‘climate change’ and the impending catastrophic implications unless we change our ways – PLEASE do some reading. NO is the short answer so please stop using that as your starting point or measure stick. It was a slow transition in from ’74 and it will need a slow transition out because you cannot start doing overnight adjustments like getting rid of bonds etc without throwing a huge wrench into the works…and their in lies the rub. What does the ‘transition state’ look like in terms of implementation? What is the staggered approach? We know a better balance is required so I do not think there is any ‘silver bullet’ to this challenge. Printing more money is not necessarily the answer because you’re creating fiat currency especially if you have nothing to back it up – gold standard typically. Fractional banking is a massive elephant in this room but I have yet to read any economic theory where that is removed from the equation…not saying you can’t just saying I haven’t heard how it can work. Caveat – there is public banking in the states (Montana I believe really leverages this) and I’m curious if they’ve managed to get rid of fractional banking. The big problem is government growth complete with a massive employee base, massive number of consultants, programs that perpetuate ‘some’ form of ‘welfare’ (and they don’t work except for very short term), corporate welfare (‘green’ companies have made this an art form), and that’s before getting into the long term liabilities created by gov employee pension plans that massively value anything in the private sector. This massive beast is killing all these nations suffering debt issues globally…Greece being one of the most obvious. “The trouble with socialism is that eventually you run out of other people’s money”…Thatcher, I believe. That massive government bloat is then compounded by our current banking model for national monies. Get the spending under control and you’ll have solved half your problem…its that unsustainable growth that’s killing us. And a little google is an amazing thing… Some interesting options. I am developing a Thesis related to: Banking, Finance, Financial Capital, FOREX, and the sovereign nation-state in the 21st century. Under your web site, dealing with ‘Canada’s Federal Debt’, you present information (bona fides extracts?) from what appears to be (at first glance) information retrieved from the Bank of International Settlement’s publications, and/or pronouncements. If my assumptions are correct, they may be snippets that I can use in my Thesis . However, before I can use them, I will requires CLEAR and SPECIFIC citations as to what precise document they were extracted from, along with the date they were published before I could use them. Might you, or someone in your organization… perhaps the author of this web site be able to provide me with the citations I require. If you do in fact respond positively to my request, please prefix your email with the word THESIS. 99.99% of all my received emails are immediately deleted… never opened, unless I know the sender at the other end. My philosophical, practical banking, and monetary sentiments are somewhat aligned with yours. My Thesis will offer up a proposed new paradigm for public debate. I hope to add some new thoughts, and vitality to the discourse that is now beginning to flower. As a small aside: COMER is on the right track. Every time you share the facts in this excellent piece with a thoughtful Canadian, of any political stripe, you can watch their blood begin to boil. The current regime better watch their backs lest, following the upcoming federal election, a new gov’t determines that the PC’s pet billc51’s loose definition of ‘terrorism’ can be interpreted to include systemic financial/monetary treason. That would be delicious irony indeud if I’ve every tasted any. Those to subscribe to the Keynesian theory of monetary mechanics base their position on an assumption that in a system grounded in the Austrian school on monetary mechanics, governments will spend money like drunken sailors. Nothing can be further from the truth. As an example, in reading the Bank of Canada Act, which Keynesian proponents have not done diligently, you will find the necessary checks and balances for providing interest free loans to the various levels of government. There are criteria to be met to obtain the loan in the first place, as well as strict guidelines to be followed to extinguish loans from Canada’s public bank. The people of this country have been robbed of their wealth for years to build up the profits of big banks. It is time to end it and put the exclusive power to create money back in the hands of government and our public bank. It is suspected that at least Lincoln and maybe Kennedy were killed for trying to get out of this interest trap. Maybe our politicians would prefer not to be assassinated! Same reason that we always end up paying through the nose when we use our money to build a project and then sell them at bargain basement prices to the private sector (407 ETR and Skydome!!) For shame! The first thing that needs to be done AFTER taking the power to create money (i.e. money as DEBT) away from the private-commercial banks, and putting it back into the hands of OUR publically owned Bank of Canada (i.e. money created as VALUE – virtually interest free), is to set up an independent committee of individuals (of course, without any conflicts of interest) to determine how much of Canada’s debt is “ODIOUS DEBT”!!! Based on the Canadian Constitution and Bank of Canada Act it would appear that not ONLY is much of our debt “odious” or “illegal” or “illegitimate” debt but also those who are responsible for incurring this “odious” or “illegal” debt” need to be criminally charged, fined and/or sent to prison. That is, as a consequence of having been found guilty. Only then, can Canadians slowly move toward a 100% gold standard (as the safest and most honest form of monetary policy) by first, or in the mean time, transitioning to a 100% money system advocated by Irving Fisher and the Chicago school in the 1930’s. The book entry debt system has replaced real currency (gold and silver). It is counterfeiting but since the book entry money looks the same on the ledger as does real money and the conterfeit money does not leave the bank it is impossible to tell that it is counterfeit. The banks charge interest on counterfeit money to make you think it is real money. A lot of head games being played by the banks. They have perfected this form of robbery and they first of all get your trust by offering to guard and protect your money. They do the same with the government. To enable ordinary people to acquire equity you would have to pass renter equity legislation whereby the rent paid would count as equity inthe property being rented. Interest paid by the people on counterfeit money in the past would be credited as an asset to the government. This would allow for infrastructure investment and job creation. Such legislation would lead to equality. It would make people more responsible as citizens because they would become property owners. This is something Canada could do for the rest of the world. People!!! Only spend what you make. Don’t blame the person or institution that Lends you money for your shortfalls. Such a simple solution. This apples to governments as well. If you want to spend money on infrastructure, borrow it from your people through Canada savings bonds. If people need the infrastructure, they should put their money where their mouth is. Quickest and most painless way out of this problem is for Quebec to declare independance and refuse any debt. THEN; for Quebec to annex the remaining provinces and territories. The debts remain the problem of the creditors who mistakenly loaned the defunct governments funds. There was a initiative launched in Switzerland on Dec. 01 2015 which will address some of the major faults of our money system. Check the website below and click on the english version. The Vollgeld Initiative doesn’t deal with the fact that the Swiss National Bank, like ALL other (except Canada) central banks, is not owned/controlled by the Swiss, but rather owned/operated as a private corporation answerable to the root cause of the current global financial disease…the BIS. The only acceptable solution(s) must begin by first eliminating the disease masquerading as a cure…with either nationalization of ALL existing central banks…or shutting them down. Wrong: the swiss national bank is owned 60% by the cantons (swiss provinces) and about 40% by private investors. The link for the 3rd source is broken. Does anybody know where I can find a copy of it?! Thanks! We have updated the link to the Auditor General’s report for 1993, which was archived by the Government of Canada. Let’s admit the current way of government borrowing money from the banks is a huge mistake and begin to correct this situation. “The Web of Debt” by Ellen Brown is an excellent book which covers the history of money and banking. Including a detailed accounting of how the fractional reserve system came into being, and the fight that Americans undertook to keep the Zionist bankers from gaining control of their money supply. They of course lost the battle 12/23/1913 when the congress handed the control of the money supply to the PRIVATE federal reserve bank. Much as we lost the battle in Canada when the former Trudeau allowed the banksters to hood wink him into adopting the BIS system of borrowing for our federal government. Apparently he did not understand the full ramifications of this decision, which he later was said to have deeply regretted. Ellen Brown has published a more recent book on borrowing money entitled “Public Bank Solutions”. It contains some good information about Canada and more details about many other countries. The first part of this book provides a review of the “Web of Debt” and then follows with helpful new material. For anyone else interested in this topic, it is not necessary to read the earlier book. The new one covers the full range of information. Your comment regarding the source of borrowed money by the Canadian government is well-taken. The Qualicum Institute’s website now contains an additional article entitled “Inflation” that specifies the sources of Canada’s loans other than the Bank of Canada. It identifies the increased borrowing from private banks, insurance companies, and pension funds from 1974 to the present. It also shows the rapid accumulation of government debt as a result of the shift to these private borrowing sources. Ah, John Monroe’s typical knee-JERK contrarian reaction to this history, he just can’t handle the claims of groups like COMER and others that understand the change in use of the BoC post 1974. MUCH OF THE MONIES, not all. The change was that they borrowed more heavily from investors instead of the BoC. It still baffles me as to why you’ve got such a hate on for monetary reformers that want to see an end to private enrichment from public debt. Yes the government continued to borrow from the bank of Canada but the bank of Canada started to borrow from private banks rather than creating our own money supply as we had been doing since 1938. and in there lies the problem and how Canada was turned over to the private banks and the beginning of our down fall.